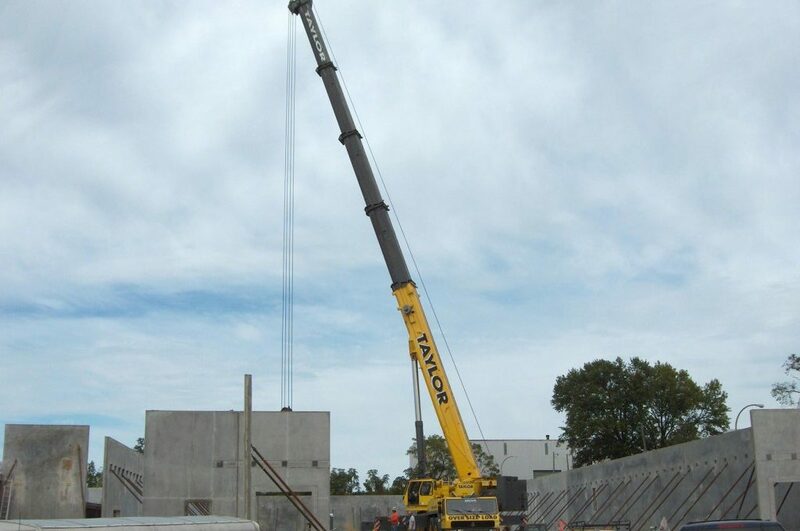 From construction to highway and infrastructure to heavy industrial – rent a crane with us from our crane fleet Missouri with rough terrain cranes Missouri! is extensive, dating back over 60 years. Taylor Crane works every day to be a leading crane rental company in the Midwest. One way we achieve this is through our approach to customer service. Our crane rentals come with a unique 24-hour customer service guarantee. For all of your questions and concerns, you need only one telephone number: 314-544-3030. Contact us anytime during every phase of your project. We’ll be there. Our team goes above and beyond to provide a memorable customer service experience. 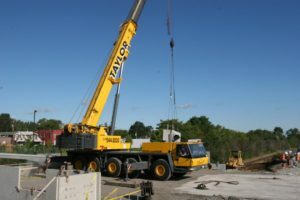 Taylor Crane offers job site consultations as well as lift planning to make sure you’re getting exactly what you need, when and where you need it. Taylor Crane: Working For You. Taylor Crane exists to provide quality construction products at an affordable price. It is our mission to make sure you are using exceptional products when and where you need them. Our diverse customers come to us whenever their projects need cranes in and around the St. Louis area. We work with a wide variety of clients in the construction industry, including: general contractors, steel erectors, mechanical contractors, electrical contractors, plumbing contractors, and demolition companies. We also work directly for owners in the heavy industrial industry including: power plants, quarries, mines, refineries, cement plants, and ethanol plants. Taylor Crane: Getting the Job Done. 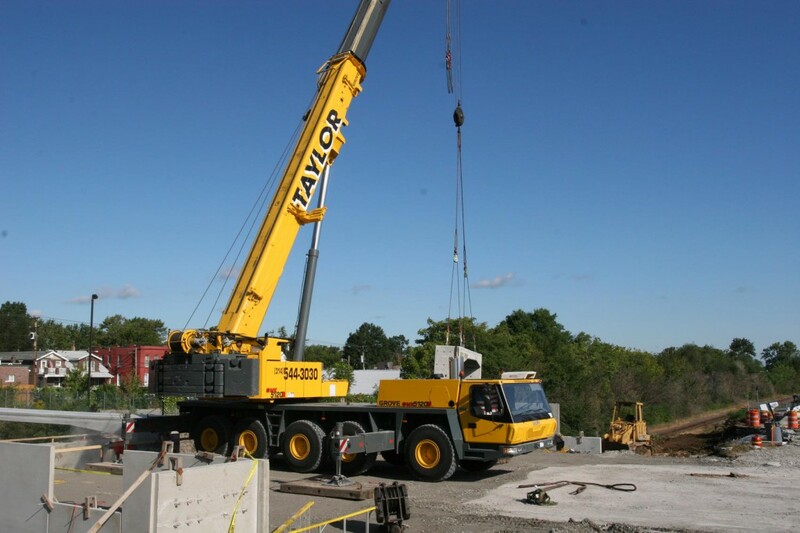 Our job at Taylor Crane is to make your projects run smoothly. We do this by eliminating as many of your concerns as possible. Operated equipment rental shouldn’t be complicated. 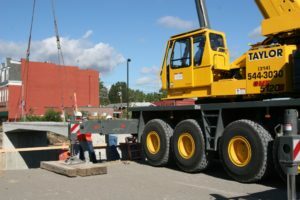 When you have equipment, to be set with a crane, being delivered to your hoist job site on multiple trucks, there is no need to worry about making sure everything shows up on time and the same day-leave that to us. We provide free unloading and secure storage for items to be hauled by our trucks and set with our cranes. No need to worry about cost overruns due to unfavorable delivery schedules. At Taylor Crane, we believe that the safety of each individual we work with is our responsibility. 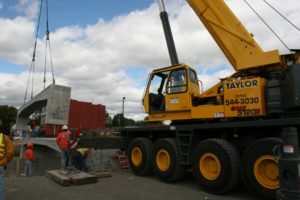 Safety education ensures that every client and employee of Taylor Crane is protected throughout each project. As a premier operated crane rental company, safety is our main priority. All of our operators complete a three year apprenticeship program and they become CCO certified through the National Commission for the Certification of Crane Operators(NCCCO). Our operators receive additional training through frequent toolbox safety discussions, on the job safety meetings, annual company safety meeting and test, and on the job safety inspections.